Jesse Posa, NY/NJ’s leading Frank Sinatra Impersonator lookalike recently performs as Frank Sinatra in a live show at New York City’s world famous Radio City Muisc Hall. 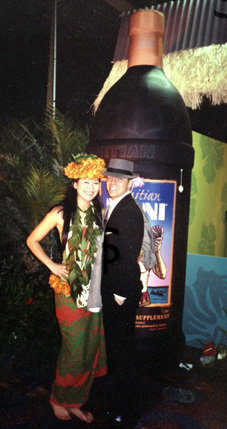 This special event was to celebrate the product release of Tahitian Noni, the first noni juice on the market. The audienace of over 6,000, consisted of peoplefrom all parts of the uSA, from California (CA) and Nevada (NV) as well as Maine (ME), Vermont (VT) and Massachusetts (MA). The party then continued to the New York Hilton. No, Paris was not there and her Sidekick pager with all its numbers was nowhere to be found. But this Frank Sinatra impersonator was STILL performing, knocking them all dead! Find out how to this Frank Sinatra celebrity lookalike who not only Looks Like Frank, Sounds Like Frank but even acts Like Frank sing and perform at your next party or corporate event or product launch. Sinatra swings at the Rainbow Room!! Sinatra appears in Italian Vogue!!!!! Happy Holidays from Swinging as Sinatra! Sinatra at the Metropolitan Room in NYC!!! Jesse Posa is a leading Frank Sinatra impersonator and Sinatra lookalike in the New York City/ New York, NY/NYC area and has been a big hit with audiences of all ages with his young Frank Sinatra impersonation shows. Jesse Posa has also been performing as Frank Sinatra In New Jersey (NJ), Connecticut (CT), and Pennsylvania (PA) on stage as well as on television and video.